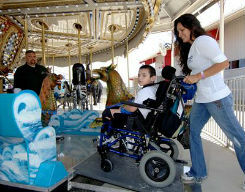 Morgan’s Wonderland is still the first and only theme park in the world where all of the rides are fully accessible and sensory-friendly. Cedar Point - on a Lake Erie peninsula in Sandusky, Ohio. Cedar Point is appropriate for guests with an autism spectrum disorder (ASD) as they have taken steps to be well-prepared to welcome and provide accommodations for all types of disabilities, including autism and related disorders. According to one review it combines a top water park with three world class wooden roller coasters. Second, the tickets are affordable, food is not overpriced and you don’t pay for extras. Third, the safari-themed water park includes the world’s two longest water coasters, numerous family raft slides and water slides, two wave pools, a lazy river, two family “tipping bucket” water-play attractions, plus dedicated children’s slides and play areas. Parents can get a special wrist band for their kids allowing them to skip lines. If traveling with little ones, check out the KIDsiderate ® website for tips on things to do, ride suggestions and much more. Currently owned by SeaWorld Entertainment this offers thrilling coasters and kid-friendly attractions to world-class dining and shows for the whole family. Invade uncharted territory on InvadR™, an all-new wooden roller coaster that features a 74-foot drop and nine airtime hills and more. Spring into fun with a host of family activities, including a visit from celebrity animal expert Jack Hanna, KIDsiderate® concerts, characters at Sesame Street ® Forest of Fun ™ or head over to Wolf Haven to learn more about some North American predators. Shops, restaurants, show venues and the majority of our rides and attractions are ADA accessible to guests who use wheelchairs or are in need of special services. Each LEGOLAND ® Park is 100+ acres with more than 50 rides shows and attractions. It's a full day and more of family fun! With 4D cinema experiences, LEGO® rides, MINILAND® and more, join us for a great indoor family experience. Find your local LEGOLAND® Discovery Center!